(Bloomberg) -- A Huawei Technologies Co. executive facing extradition to the U.S. has “strong arguments” to make against extradition in part because of comments by President Donald Trump, Canada’s ambassador to China said. 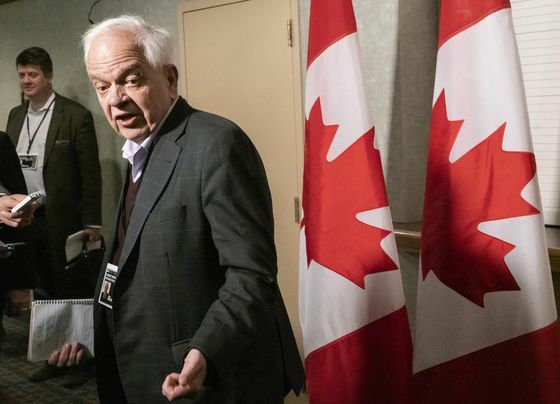 John McCallum, in a news conference held near Toronto on Tuesday largely with Chinese-language media, highlighted Meng Wanzhou’s legal options after her arrest Dec. 1 in Vancouver. The U.S. is seeking her extradition, but such legal fights can take years. Trump has said he would consider intervening in Meng’s case if it meant reaching a better trade deal with China. Canadian government officials confirmed McCallum spoke Tuesday in Markham, a Toronto suburb with a large Chinese population. The comments by Justin Trudeau’s envoy to Beijing are the most detailed yet from the Canadian government on the plight of Huawei’s chief financial officer and daughter of its founder. Asked about McCallum’s remarks, a spokesman for Foreign Minister Chrystia Freeland said “Canada is conducting a fair, unbiased and transparent legal proceeding” in Meng’s case. “There has been no political involvement in this process. Canada respects its international legal commitments, including by honoring its extradition treaty with the United States,” spokesman Adam Austen said by email Wednesday. McCallum’s comments are the latest by Trudeau officials distancing the government from Meng’s case -- saying, essentially, Canada’s hands are tied because of an extradition treaty. McCallum said so several times in the Tuesday press conference, and Freeland made similar comments herself that day. Since Meng’s arrest, China has detained two Canadians -- diplomat Michael Kovrig and businessman Michael Spavor -- for national security investigations, prompting widespread calls for their release. China has also sentenced a third Canadian man to death on a drug charge. He also stressed the close ties between China and Canada -- at one point, on a personal note, saying all three of his sons had married Chinese women. Trudeau was asked Wednesday whether he agreed with McCallum that Meng has strong arguments to make. The prime minister declined to say. “Canada is a country of the rule of law and we will make sure that the rule of law is properly and fully followed -- that of course includes the opportunity for her to mount a strong defense,” Trudeau told reporters in Saskatchewan. His government, meanwhile, continues to weigh whether to restrict or ban Huawei from its 5G network. “There’s pressure on Canada to say no” because other countries in the so-called Five Eyes intelligence network have done so, McCallum said. China’s ambassador to Canada has warned of repercussions if Huawei is banned, though a spokeswoman for China’s foreign ministry later downplayed that remark. McCallum cited the different views in his press conference. “It seems the ambassador and the foreign minister don’t agree with each other,” he said, adding he believes the foreign ministry’s view is more senior. Meng’s arrest “was a total surprise for everybody in Canada, but it happened and we have to deal with it,” the ambassador said. Her next hearing is scheduled for early February and will deal with bail conditions. Another in March will begin to deal with extradition, but any trial is still months away, he said. “Certainly, Canada -- through no choice of our own -- is stuck in a dispute between the United States and China,” he said.